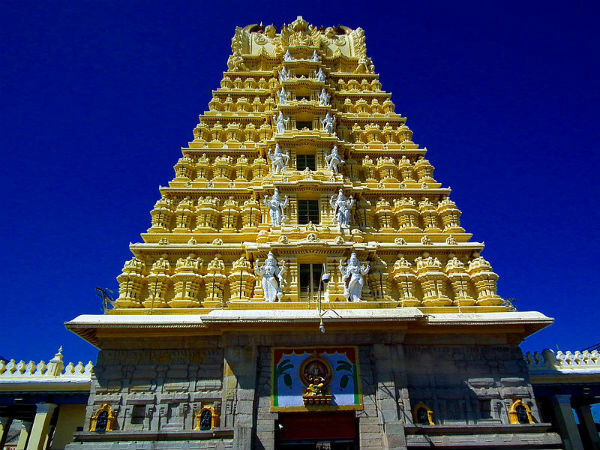 Chamundi or Chamundeshwari temple is one of the most well known shrines in Karnataka. The temple is 1000 odd years old and is dedicated to Goddess Chamundeshwari, an incarnation of Parvathi Devi. The temple is located atop the Chamundi hill which is at a height of 3000 ft and is one of the most prominent landmarks of Mysore. The temple is said to have been built in the 12th century by a Hoysala King, Vishnuvardhana; certain sources say that the shrine is even older. The temple has seen the rise and fall of many dynasties like the glorious Vijayanagara empire, the Wodeyar dynasty and many more. Goddess Chamundeshwari is considered as the family deity of the Mysore Maharajas who expanded and paved the way for the growth of the temple. Going by the Puranas, there were two Asura brothers, Sumba and Nisumba who had got several boons from the gods through severe penance and began to trouble the gods and the people on earth. The troubled gods approached Parvathi, who was incarnated as a young maiden and appeared on earth. The brothers were awestruck by the beauty of the maiden and sent two of their generals named Sandan and Mundan to bring the maiden to them, which they failed and the generals tried to get her by force but got killed by the Goddess. As she killed Sandan and Mundan, she was called Samundi or Samundieshwari which later became Chamundi. The goddess is also known as Mahishasura Mardini, as she vanquished a demon named Mahishasura. An interesting factor is that one can find a colourful statue of the demon, who welcomes the visitors before heading to the shrine. Nandi is the vehicle of Lord Shiva. One can find a monolith which measures over 15 ft in height and 24 ft in length. The credit to the creation of this image is given to Dooda Devaraja Wodeyar who was one of the illustrious Kings of Mysore. The Maharaja also commissioned the construction of the stairway to the hilltop. One can find the Nandi monolith as you reach the 800th step. Originally this was a mammoth boulder and the image of Nandi was later carved out of this boulder. One can find boulders of similar sizes around the place. One can also find a small cave temple dedicated to Lord Shiva under one of these boulders. The statue is of huge proportion but with fine detailing, it makes it a sight not to be missed. One can notice the sequences of bells and garlands carved over the bull, with his ears pointed in attention and the expression on the face is something which is not to be missed. The shrine of Mahabaleshwara is located close to the Chamundeshwari temple, but does not receive much crowd like the Devi shrine. As a matter of fact, the shrine of Mahabaleshwara is much older than the shrine of the goddess. The temple is believed to have been built in the 8th century by the Ganga Kings and is the original temple of Chamundi Hills, before the Chamundeshwari shrine was patronized by the Wodeyar kings. The shrine houses a Mukha lingam of Lord Shiva, with the lord's face embedded in the lingam. One can also find a shrine which houses Shiva in his Nataraja form which is a rarity.